THE RELIGION CLAUSES OF THE FIRST AMENDMENT: GUARANTEES OF STATES’ RIGHTS?, by Ellis M. West. Lanham, MD: Lexington Books, 2011. 250pp. Cloth $70.00. ISBN: 9780739146774. Reviewed by Kevin R. den Dulk, Department of Political Science, Calvin College. Email: kdendulk [at] calvin.edu. The familiar words of the Religion Clauses of the First Amendment raise the question of not only where to place the lines between religion and the state, but also who should draw those lines. Yet the words themselves do not yield easy answers to these questions. To be sure, “Congress” is the explicit subject of the First Amendment, leading many scholars to make some version of the argument that the Religion Clauses are focused narrowly on limiting the role of the national government in regulating religion. But these scholars, as well as those of different persuasions, rarely point to the text of the Religion Clauses themselves and claim that their arguments flow ineluctably from a mere sixteen words. The reason, of course, is that the text is embedded in a context, a history of dynamic constitutional development in which myriad and shifting contentions about liberty, social identity, national culture, and political authority render the First Amendment’s meaning anything but self-evident. 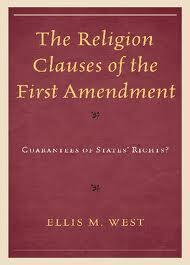 Ellis West’s The Religion Clauses of the First Amendment is particularly focused on the question of who draws the lines and why, and he approaches the topic through an extended critique of a states’ rights perspective on religion. While West discusses various proponents of this perspective, his primary target is legal scholar Steven Smith and his book, Foreordained Failure. In the first part of his book, Smith had maintained that the purpose of the Religion Clauses was purely “jurisdictional,” i.e., to protect from federal encroachment the exclusive power of states to regulate religion. As a result, the framers provided no “substantive” guidance on where the lines between religion and the state should be drawn. This is one of several reasons Smith concludes that the search for a coherent constitutional theory of religious freedom is fruitless. It is a testament to the provocative nature of Smith’s thesis that it would generate a book-length assessment over a decade and a half after its original articulation. West’s basic response to the jurisdictional argument is to insist that it rests on a dubious logic. It does not follow from the Religion Clauses’ prohibition on certain congressional actions regarding religion that the Clauses were intended to authorize states to take those same actions. In West’s view, Smith and others can make the move from the premise of congressional prohibition to the conclusion about states’ rights only by marshaling historical evidence about the original purpose of the Religion Clauses. But West sees the historical argument supporting a jurisdictional perspective as fraught with “specious reasoning and unwarranted assumptions” (p.x) based “mostly … on circumstantial evidence” (p.8). West contends that the more compelling conclusion is that the Establishment and Free Exercise Clauses [*59] together enshrine the natural right of individual religious liberty against the national government, not an institutional power of states to abridge that liberty. West is admirably concerned about clarity of language, and devotes the second chapter of The Religion Clauses of the First Amendment to laying out his own terms and definitions. Along the way, he rejects Smith’s use of terms such as “jurisdictional” and “substantive” because they only vaguely suggest the competing reasons for the inclusion of the Religion Clauses into the Constitution – and these reasons are precisely West’s preoccupation in this book. West prefers to describe Smith’s position as “federalist,” which reflects the underlying theory of split political authority between national and state governments. West describes his own position as “normative,” which he associates with protection of a natural right or “some other ethical” principle (p.22). One can easily quibble with West’s linguistic decisions here. Theories of political authority are richly normative, after all. Nevertheless, West’s efforts in this chapter serve the important purpose of fixing ideas for the remainder of the book. Chapter 3 is a critical analysis of the federalist perspective, which is ultimately described as a speculative hypothesis in need of historical evidence from the ratification debate to the early nineteenth century. This sets up the book’s core chapters, which are given over entirely to an appraisal of that evidence. Chapters 4 and 5 address the ratification debate and drafting of the Religion Clauses; Chapter 6 discusses whether the framers and ratifiers found consensus about the meaning of the Religion Clauses; and Chapter 7 explores early post-ratification debates about religious freedom in the states. These chapters are closely argued and heavy in historical detail, but the main contours of West’s arguments are straightforward. He concludes that the preponderance of the historical evidence (indeed, at times he suggests all the evidence) points to the framers and other early leaders taking a normative stance on the Religion Clauses, as he understands the term. At every step, from the framing of the Clauses to post-ratification public discourse, West sees a clear consensus that the First Amendment was intended to protect the religious freedom of individuals, especially against “European-style” establishments of religion. This is the case even though the subject of the Religion Clauses is a national institution (Congress) and many of the framers and ratifiers advocated strong states’ rights. For West, there is simply no compelling evidence that these early leaders connected the First Amendment’s national orientation to a corresponding free rein for states to regulate religion. In grappling with the views of early American elites, West has entered a well-worn area of scholarly inquiry. He knows the secondary literature well and he covers it ably. I would note just two examples of omission or short shrift. First, Drakeman’s Church, State, and Original Intent is mentioned only briefly in a couple of footnotes, but could have been used more profitably to illustrate the subtle differences between West’s normative perspective and other scholars who share his rejection of the jurisdictional/federalist argument. Second, a discussion of Driesbach, Hall and Morrison's The Forgotten Founders on Religion and Public Life which I [*60] submit raises some questions about elite-level consensus in the early republic, would have sharpened West’s analysis. But, again, these are exceptions to West’s generally thorough attention to a variety of arguments. West’s historical analysis of primary sources is forthright and systematic. He has a knack for drawing out conclusions that are not logically warranted by a premise, and he rightly insists that Smith and other proponents of a federalist perspective demonstrate their position with good historical evidence. West himself is generally careful in his use of that evidence, but I did find the occasional interpretation that was perhaps a little too charitable to his own position. To take an innocuous example: In his discussion of the ratification debate, West suggests that the Pennsylvania Anti-Federalists, who proposed a constitutional provision that would prevent the national government from meddling in state laws that protect religious freedom, had thereby “clearly implied [they] would not have objected to a federal law overruling a state law that violated religious liberty” (p. 69). This implication does not strike me as clear at all. One can imagine that the Pennsylvania Anti-Federalists may have had competing reasons – including what I would call “normative” ideas about republicanism and political authority – that would lead them to argue against federal intervention, even if that intervention would have supported a natural right. But this example, among others, does not diminish West’s overall argument. In the final analysis, his argument is sound and generally succeeds in the goal of refutation. Still, I was left wondering about the take-away from West’s intensive historical investigation. West declares in his preface – and I concur – that the book is not written for the “general public” (xi). This suggests that he intends a largely scholarly audience with interests in constitutional history and religious freedom. More specifically, he envisions the book as closing the door on what he perceives as the increasingly influential federalist perspective within that scholarly audience (pp. 3-7). But why is that a relevant concern? One answer is that West seems to be worried, “as a practical matter,” that the scholarly dispute could have a “major impact” on Supreme Court interpretation, especially if justices who are partial to originalism succumb to the federalist position (p. 5). Another answer is that West is interested not merely in refuting the federalist position, but also in arguing in favor of the view that the “original meaning” of the Clauses, which he claims was to protect an individual’s natural right to religious liberty, is normative for us today. I suspect West would affirm both answers. But whether readers are convinced that West succeeds, especially on the latter goal of making a positive argument, depends significantly on whether they accept his underlying originalism. West clearly assumes that to determine the original meaning of the Clauses is to determine the definitive meaning of the Clauses. But, of course, the originalist approach is, to say the least, controversial. The problem is that West never seriously defends it. Even if readers accept that West has discovered the “original meaning,” and even if they accept that his discovery undermines Smith’s argument, it does not follow that that meaning ought to be, as West suggests near the end of the book, [*61] “perfectly appropriate” (p.185) as an interpretive framework for the Supreme Court or anyone else. That would require a different kind of argument. Perhaps that will be the subject West’s next book. In the meantime, The Religion Clauses of the First Amendment stands out in a literature that has recently exploded with interest about views on religion in the early republic. His passion for the topic is palpable, but it does not cloud his careful attention to both the historical record and the current debates about the Religion Clauses. Drakeman, Donald L. 2010. Church, State, and Original Intent. New York: Cambridge University Press. Dreisbach, Daniel L., Mark David Hall, and Jeffry H. Morrison, eds. 2009. The Forgotten Founders on Religion and Public Life. South Bend, IN: University of Notre Dame Press. Smith, Steven D. 1995. Foreordained Failure: The Quest for a Constitutional Principle of Religious Freedom. New York: Oxford University Press. Copyright by the Author, Kevin R. den Dulk.